Forever reinterpreted and re-purposed, a given place finds its relevance in the experience of being or getting there. 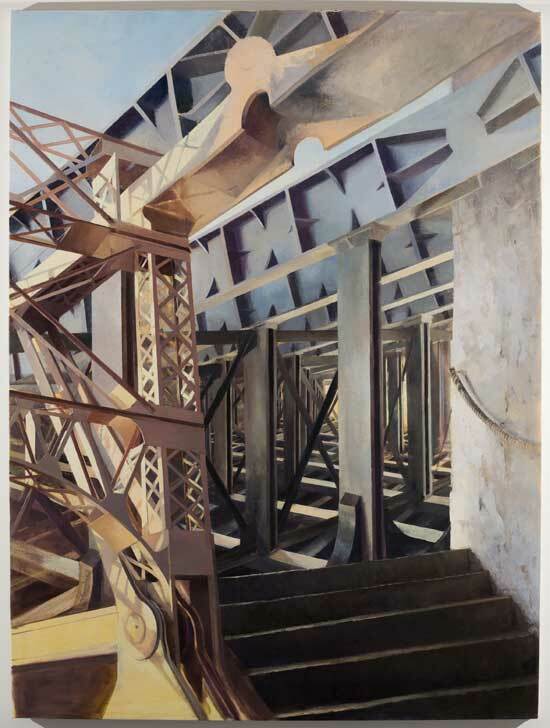 Nemett’s work responds to the lived, remembered, and imagined histories that have become the anecdotal anchors of aged buildings, and the possibilities of what (and who) might enter the skeletons of new constructions. Based off of her own cardboard models and related drawings, her paintings piece together fragments of place, and the incongruous ways we arrive at our destinations. At a slant. Platform Gallery in collaboration with The Institute for Contemporary Art Baltimore (ICA) proudly presents Tell it Slant, Laini Nemett’s new solo exhibition, opening on September 12th at Platform Gallery, located on 116 West Mulberry Street, Baltimore, Maryland. This is the fourth show of Platform, a new gallery, which functions as a commercial gallery posed between two areas of Baltimore: Mount Vernon/Cathedral Hill and Lexington Market. Collaborating with ICA works in alignment with Platform’s mission to serve various communities and organizations in Baltimore and further showcase important emerging artists such as in Laini Nemett. Furthermore, the space, opened to a local audience of Baltimore’s diverse demographics, functions to responsibly engage with all cultures, genders, classes, and races of Baltimore and the surrounding spaces. Platform Gallery is hosted on the first floor of Platform Arts Center (PAC), which provides studio spaces for young artists. Platform Gallery and PAC both share a fundamental goal: to strengthen the relationships between the neighbors and artists who are in the building and/or showing in the building. Platform’s initiative and mission reflects the artistic process of both myself, and Lydia Pettit, co-director and co-founder of Platform Gallery and director of PAC. Personally, art has functioned as a religion for me since a young age. I believed that a religious practice should exist as a selfless, universal entity that brings reason and comfort to whoever believes. Through my undergraduate education at Maryland Institute College of Art (MICA), I have redirected this belief into the creation of exhibitions as well as a body of paintings. Going into curatorial studies as a studio artist rather than becoming an art historian has certainly humbled my demeanor and affected the way I develop projects. I have learned that exhibitions, programs, and public art hold the responsibility of reflecting on culture, and being accessible to as many individuals as possible. Similarly to the way Lydia and I think, the concepts behind Platform’s exhibitions are simple and universal. 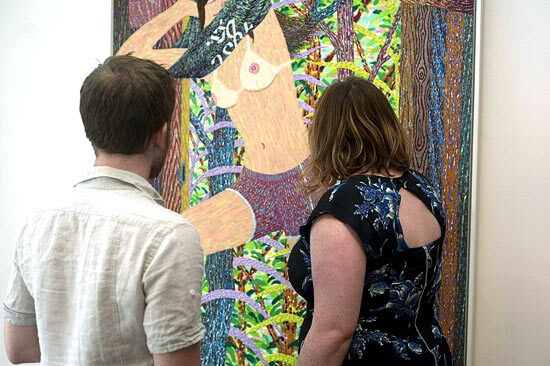 In June we hosted a dual artist show with Jeffrey Kent and Stephen Towns, Tradition and Interpretation, which confronts the idea of repurposing traditions set as a child to create your own paths. Both artists moved to Baltimore, and have thus changed their work due to the cultural atmosphere. Our second show, Starcrossed: The Art of Baltimore Promotion looked into Baltimore’s history of promoting live music and bands, where we exhibited the priceless Globe Letterpress Collection hosted at MICA as well as contemporary poster designers and printmakers. Our recent show, a r t + c r u s h, follows the most universal concept for artists alike: the influence and adoration of another creator that results in a positive reflection on your work. This show explored the different age and cultural facets within the art community: students, graduate students, and established artists. It is important that a passerby from the local Enoch Pratt Library or the Walters may walk by and not recognize the artists – Xinyi Cheng, Ben Degen, Louis Fratino or David Humphrey – but would relate to the idea of having a crush or be attracted to the aesthetic qualities of the work. Graduating in 2014 with a BFA has resulted in an overriding amount of pressure for most post-graduates including myself. Instead of focusing on new concepts and theories to pursue, a number of my peers are drained with the fear of failure – that not having a full-time, salaried, job with benefits immediately out of college will ruin their lives. If unaddressed, there is a cost to this fear to all of us. This is not the time to focus on the expectations of the past, but rather what the current generation of makers and artists need. Deciding that she needed a studio to continue her practice as a painter, Lydia Pettit used her savings to buy the row-home at 116 West Mulberry Street to convert into studios for young artists. Her mission for this project was to build studios that are affordable, with the goal of filling the studios before Spring 2014. During this process, Lydia decided that the studios would function not only as a business endeavor, but also a community. Platform Gallery arose from this opportunity and has become a vehicle for artists to grow, and as a mechanism to invite the greater Baltimore communities into more open discussions with the hopes of forging a new, inclusive art scene. Platform promises to create driving, thought-provoking shows that question the relationship between artist, curator, and community as well as to provide opportunities for Baltimore and regional artists to show their work. Exhibitions span from showcasing emerging artists who are paving their ways into contemporary art world to curated exhibitions that investigate historical art in Baltimore. For the future, Platform hopes to extend beneficial programs involving art and the local community as well as exhibitions that reach out past Baltimore to international locations. Laini Newmett is a New York based painter that has been a recipient of a Fulbright Fellowship to paint in Barcelona, Spain, a Joan Mitchell Foundation MFA Grant, and has participated in various residencies including the Jentel Artist Residency, UCross Foundation Residency, and the Alfred & Trafford Klots International Residency in Léhon, France. Newmett’s work explores interiors and the idea of home. Platform Arts Center (PAC) and Platform Gallery exist in a building built in the 1830’s that reflects Baltimore’s rich, urban architectural history. So, 116 W Mulberry seemed to be the perfect that reflects location for not only PAC and Platform, but for this particular exhibition, Tell it Slant. ICA Baltimore is a collaboration of volunteers working to stage contemporary art exhibitions in available spaces in Baltimore. Tell It Slant is the twelfth exhibition by the ICA since 2011. 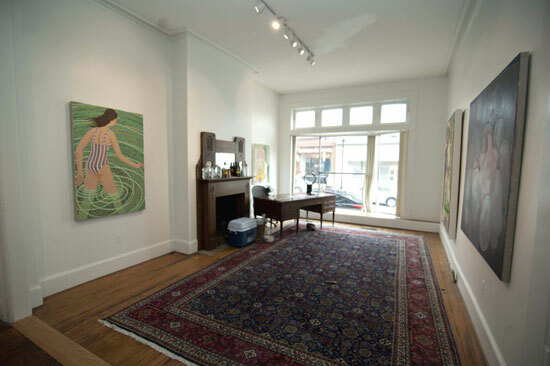 Platform Gallery is a commercial gallery in Baltimore, which opened in May 2014. Run by women, Platform promises to excite audiences beyond the art community, challenge convention, create new paths, and open its doors to change. Lydia Pettit is an artist based in Baltimore, Maryland. She attended the Maryland Institute College of Art to attain her BFA in Painting. She opened and now runs Platform Arts Center, an affordable community of studios in Baltimore that hosts Platform Gallery on the first floor. Abigail Parrish is a curator, painter and arts administrator newly graduated from MICA in 2014 with a BFA in Painting and a Concentration in Art History and Curatorial Studies.